Did you experienced having pain after many hours of typing on your computer? During my early years of working in office I remember doing rush technical proposal and all of us in the team need to help each other's work. We finished our work as promised and beaten our due time but our hands are so tired from having continuous papers to finish. This wristrest mouse duo gel is truly helpful to those who works extensively so they will find a way to rest their hands. 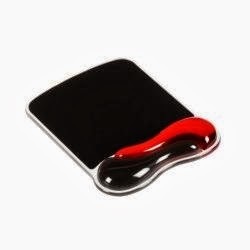 This mousepad can distribute wrist pressure throughout the super soft gel for more comfortable typing and has natural ventilation between moulds which keeps the hands cool and dry. Aside from looking so stylish with colours red and black it also has a non-slip base that keeps pad in place. Sells at USD9.36 at Amazon.